It’s the “Edinburgh of the South”, known for its proud heritage, nineteenth century architecture and old world cultural ties. Some of New Zealand’s best known companies, including Fletcher Construction and Hallensteins were established in Dunedin and the city is also home to the country’s oldest university and newspaper. But Dunedin is also “scarfie” city, famed as a student centre and for the lifestyle that accompanies it. With over 21,000 people enrolled at the University of Otago – and many more at the Otago Polytechnic and the teacher’s training college – students and academia play a major role in the city. This means that Dunedin’s property market is effectively in two distinct parts. There’s the more traditional family-oriented residential market in the suburbs and then there’s the busy, inner city student market. For investors, it’s critical to understand that. But it’s equally important to know that Dunedin’s market has been the star performer amongst the main centres of late. While price growth in other centres has slowed or flat-lined, Dunedin continues to see double digit growth and high demand coupled with a shortage of supply. Traditionally, Dunedin’s market has been a steady bet for investors. It has been characterised by affordable property prices and high yields, particularly in the student market. But more recently that has changed. According to the latest QV data, the city’s values remain on a solid upward trend having increased 10.7% in the year to August and 1.7% over the past three months. This has left Dunedin’s average property value at $415,888, as compared to $375,814 at the same time last year. Otago Property Investors’ Association president Cliff Seque agrees. He says it is still possible to buy a three-bedroom house for $350,000 and then rent it out for about $400 to $500 a week. This makes Dunedin a very attractive market for investors. In turn, it means the city is currently seeing a lot of out-of-town buyers and local demand is high too, particularly from first home buyers. Local agents say there is a widespread shortage of stock and new listings have been down over winter. Market insiders are anticipating an increase in listings as the market heads into spring. But they are also reporting that landlords are starting to sell their former student rentals to first home buyers. That’s due to the changes to housing and tenancy policy and the fact that first home buyers pay more. This too is impacting on the workings of Dunedin’s market. While the property market might be going through changes, solid economic drivers remain in place. The centrality of academia to Dunedin’s economy is a huge factor in this. Not only do the rolls of the various tertiary institutions continue to increase, but there’s a lot of construction work taking place around campus – in the form of new facilities and residences. 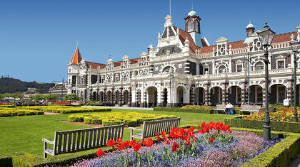 The government has also recently given the go-ahead for the redevelopment of Dunedin Hospital. The new hospital will be one of the city’s major construction projects over the next 10 years. On top of this, the Dunedin City Council has allocated $868 million for capital projects, including extensive infrastructure upgrades and an upgrade of the central city area. Another significant development project on the horizon is the development of the Dunedin waterfront and port area. The government is funding a feasibility study into the project which would include hotel and residential accommodation. According to Westpac’s latest regional round-up, economic activity levels in Otago generally are higher than in the same period last year and significantly better than the five year average. It records growth in tourism, improved conditions in the agricultural sector and increased activity in the manufacturing and services sectors. Although Dunedin itself has this year seen the closure of one of its flagship manufacturers, the Cadbury chocolate factory, the city is home to some flourishing niche industries including engineering, software engineering, bio-technology and fashion. These industries are nicely complimented by a vibrant arts and music scene. Traditionally, it has always been demand for rental accommodation that has been Dunedin’s lure for investors. With the booming student rolls and the anticipated arrival of new workers that demand is not likely to let up. Add in the supply shortage at play and the future of the city’s rental market looks rosy. The latest Trade Me Property rental price data shows the median rent in Dunedin was up by nearly 10% on last July to a record $400 per week. It has the median rent in July for a large (five or more bedroom) house at $708 per week and $415 per week for a medium (three to four bedroom) house. While the city has two distinct rental markets - it is the student market that the city is known for. Sievwright estimates there is generally a 6-7% yield possible on student rental properties, although it does depend on the age and type of property and the location. He says that demand for student rentals is high and not going anywhere. But investors thinking about that market need to be aware that it works on 12-month tenancies and that those tenancies are advertised, and let, in June-July. There are a number of things that landlords interested in the student market need to know. Seque, who owns around 80 Dunedin properties, says firstly, location is key with students preferring central areas that are handy to campus. Within this market, there is a sub-market for studios which are semi self-contained, furnished units with shared kitchen and sometimes bathroom spaces. In a studio rental, the landlord pays for utilities like power and internet. This means they can be rented for a higher price but the costs of providing them are higher. Quite a few older, inner city buildings are being converted into apartments and studios, which helps supply. In contrast, the pool of standard family houses for rent is strapped and the supply is getting tighter. That’s due to landlords getting out of the game and selling their rentals to first home buyers. When it comes to selecting where to buy, it’s no surprise that those interested in the student market are advised to buy in suburbs close to the University. Johnson also picks Maryhill along with Mornington, the older seaside suburbs of St.Kilda and St.Clair, and Andersons Bay as good suburbs to buy in. Going forward, the experts all emphasise that times are changing in Dunedin. Along with the greater compliance obligations for landlords, tenants are more educated about rental requirements these days. That means owning and managing rental properties makes for more work now. "... it pays for out-of-town investors to have a property manager on the ground". The other associated issue is that no agent I have ever dealt with in any country charges up to 15% management. Several Dunedin managers charge around this figure. We currently have a PM who appears to be doing a good job but our next visit should demonstrate if this is in fact the case. Management companies are a bitter disappointment and most have only one interest, their fee. Sorry for the bad news but please don't shoot the messenger for highlighting the problem. Instead fix the problem.